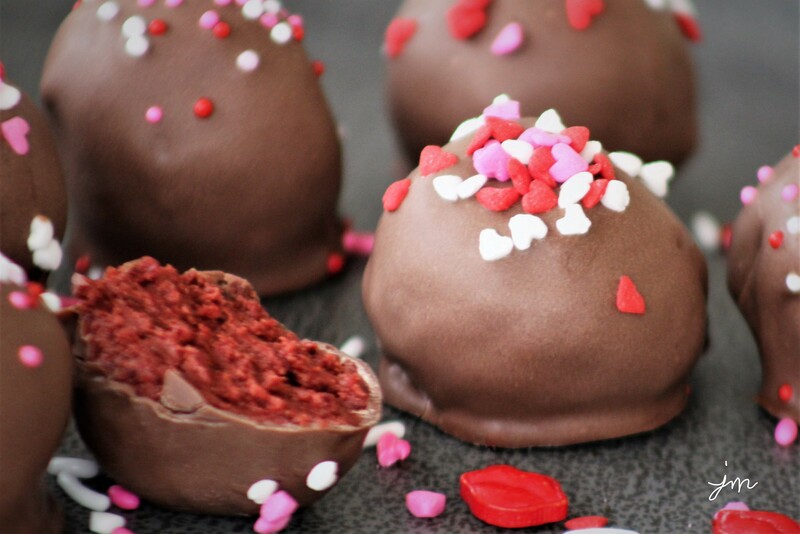 Red Velvet Oreo Chocolate Truffles (or Cookie Balls if we’re being less “fancy!”). 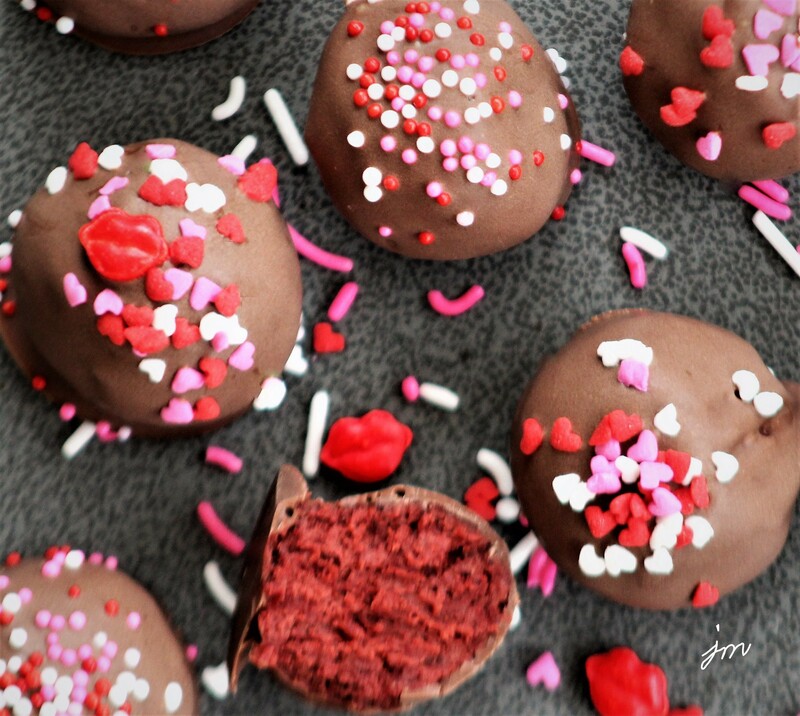 If you are looking for a simple, sweet, but festive little treat to share with friends or neighbors or with those you love, these little Red Velvet Oreo Chocolate Truffles might be just the ticket. They are so simple to make, but turn out so elegant and delish! You simply crush red velvet (or your favorite flavor) Oreo cookies in the food processor, mix with a block of cream cheese, and make into balls that you dip into chocolate. I gave little bags to neighbors with silly notes like “You are a SWEET neighbor” and “We LOVE having you for our neighbors.” I shared others with friends and family. They were a big hit! Crush oreo cookies in food processor to fine crumbs. Add softened cream cheese and combine until “dough” forms. Roll dough mixture into approximately 30 one-inch balls. Refrigerate for approximately 30 minutes. Melt chocolate. I put mine in a tall, microwave-safe cup for one minute, stir, and then microwave for 30 more seconds. Dip balls into melted chocolate with a fork, allowing excess to drip. Place on parchment paper. Decorate with sprinkles if desired. Allow to set approximately 30 minutes. 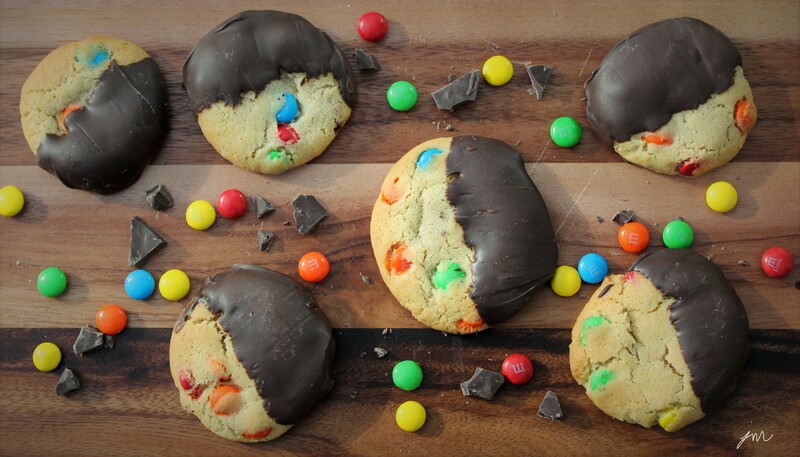 Dark Chocolate M&M Chocolate Dipped Cookies. So the thing about Christmas cookies is that it’s fun to make them fancy. 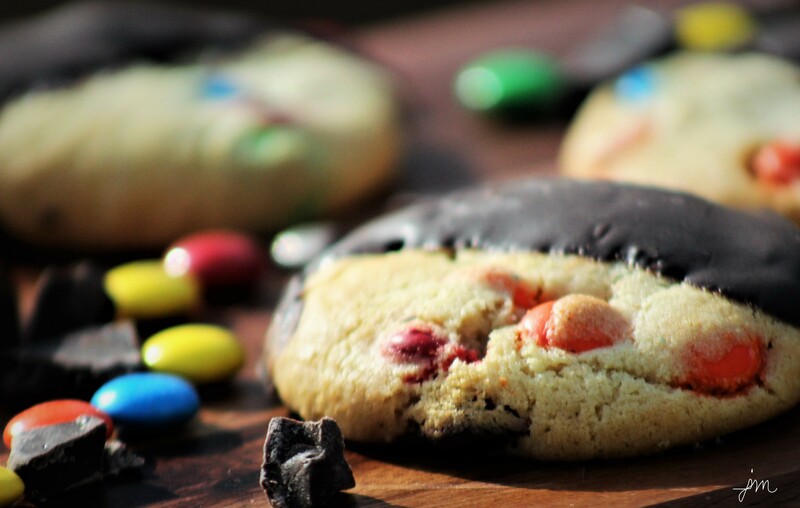 Well – sometimes fancy might mean taking a usual cookie (like my “Jodi’s Best Ever Chocolate Chip Cookies,” and using Dark Chocolate M&Ms instead of chocolate chips (DARK Chocolate M&Ms is the key here! They are insanely delicious! 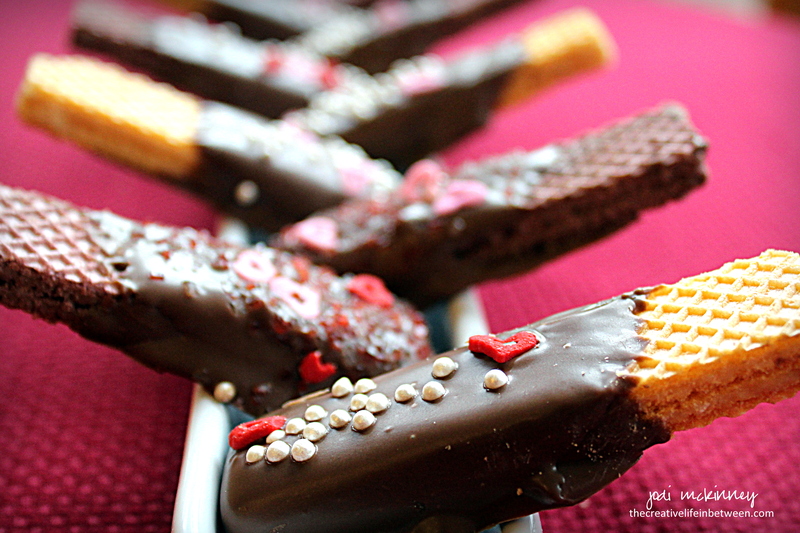 ), and then dunking them in some more dark chocolate…. …. but only half way…. They are sure to be a crowd pleaser. 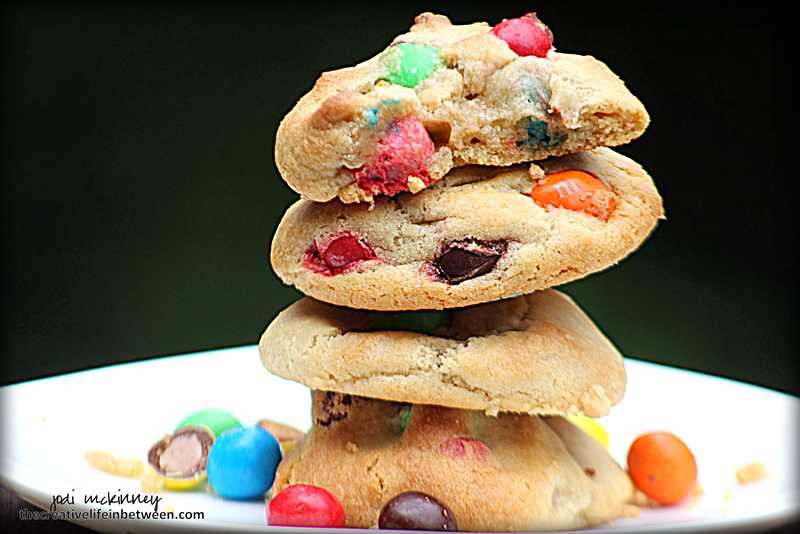 You can make these by simply following my tried and true recipe here and substituting Dark Chocolate M&Ms or your favorite Maybe you want to use chopped up Butterfingers or Snickers or Milky Way candies or maybe even peppermint sticks. What S’more fun than S’mores?! And what s’more perfect with hot cocoa or coffee than s’mores. 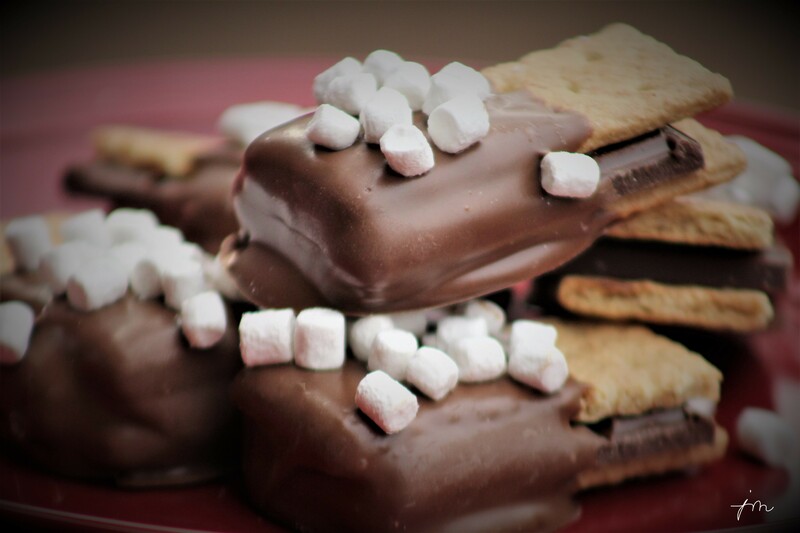 And what s’more delicious than campfire s’mores? S’more cookie bars any time of year! I love these adorable little cookie treats I learned from my daughter-in-law, Colleen, who first served them at a holiday cookie exchange she hosted a couple years ago. They are simple. They are fun. They are beautiful. And best of all, they are SCRUMPTIOUS! The teeny tiny miniature dehydrated marshmallows totally make them! I purchased them locally at Make a Cake, a local, charming little cake and candy decorating shop, but they are also available online if you can’t find them near you. Here is how to make them. 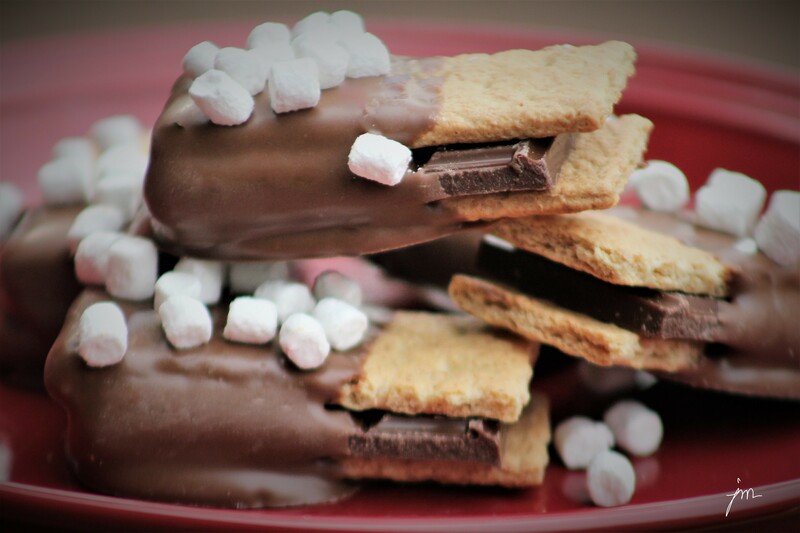 After breaking all graham crackers and chocolate bars into rectangles, place one chocolate rectangle between two graham cracker rectangles forming a sandwich. Melt Merckens milk chocolate one pound at a time in microwave. Heat for 1 minute on high. Stir well. Heat 20-30 more seconds. Stir well until smooth. Dip each graham cracker and chocolate bar sandwich into chocolate – coating 1/2 – 2/3 of cookie. Let excess drip, and place on sheet of wax paper to cool and harden. 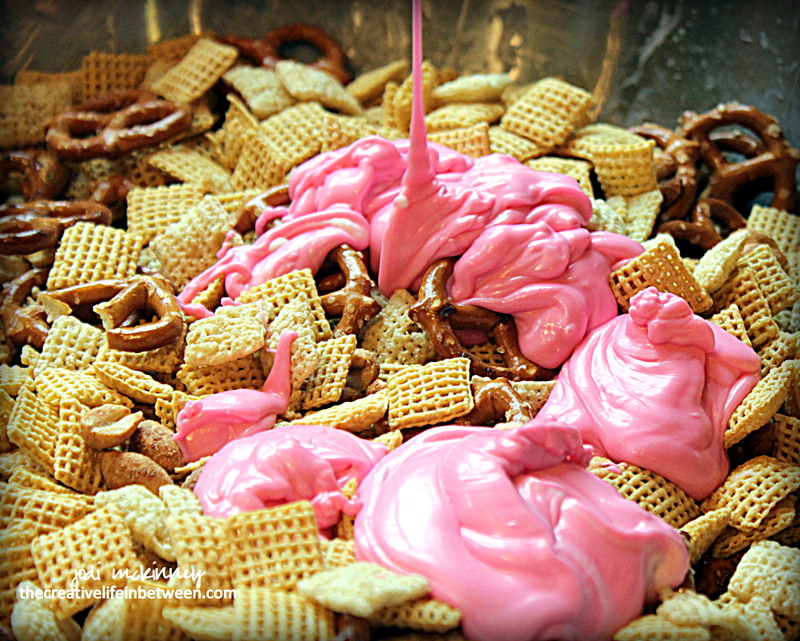 Dip 4-6, place on wax paper, and sprinkle with marshmallows. Working in groups allows the marshmallows to stick to the melted chocolate before it cools to harden. Continue until all are coated and sprinkled with marshmallows. Allow to cool and harden. They are ready within 20-30 minutes to enjoy or store in an airtight container. 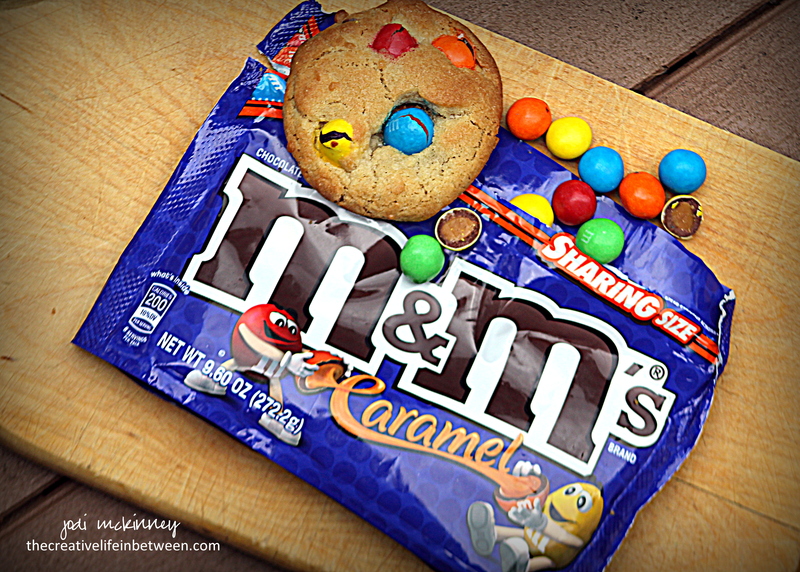 Have you tried the new Caramel M&Ms yet? I would never have believed the Mars Candy Company could made an M&M better than my favorite – Peanut. 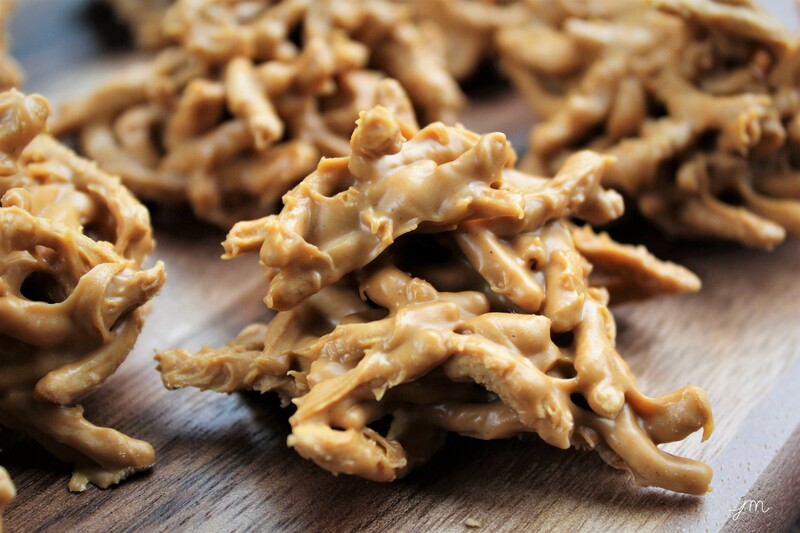 My sons love the Peanut Butter M&Ms, and I know they make Crispy and Pretzel and Dark Chocolate, and of course the good old standby – Plain – but these Caramel M&Ms…. They are just the Rock Stars of the family! 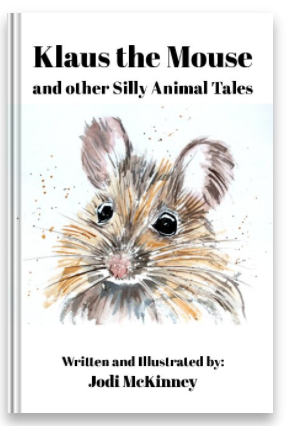 The cat’s meow… The bee’s knees.. The bomb dot com! Once hubby talked me into buying a bag and we tried, I knew I had to make cookies out of these little gems of heavenly deliciousness! And they did not disappoint! I made them for a picnic this past weekend, and it’s a good thing I took them all, because I might not be able to resist these babies! 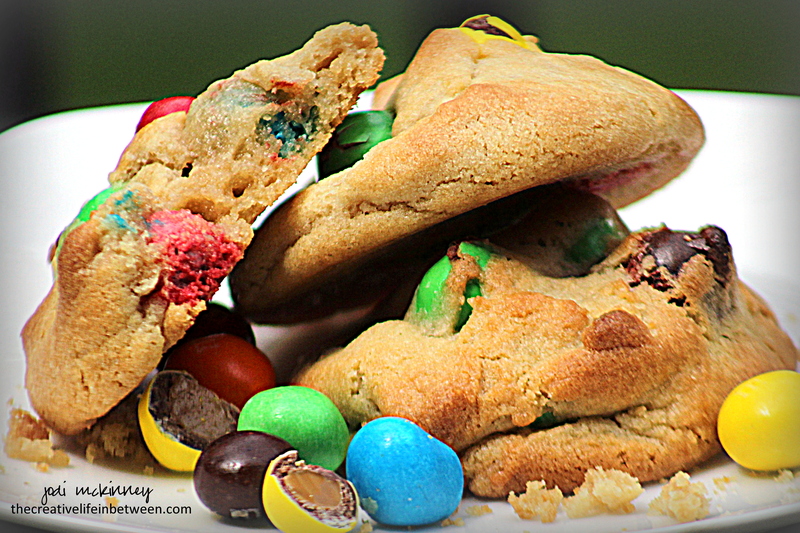 I used my standard chocolate chip cookie recipe – replacing the chocolate chunks with the Caramel M&Ms. Simple – but oh so delightful! Give them a try! Let me know if you agree. 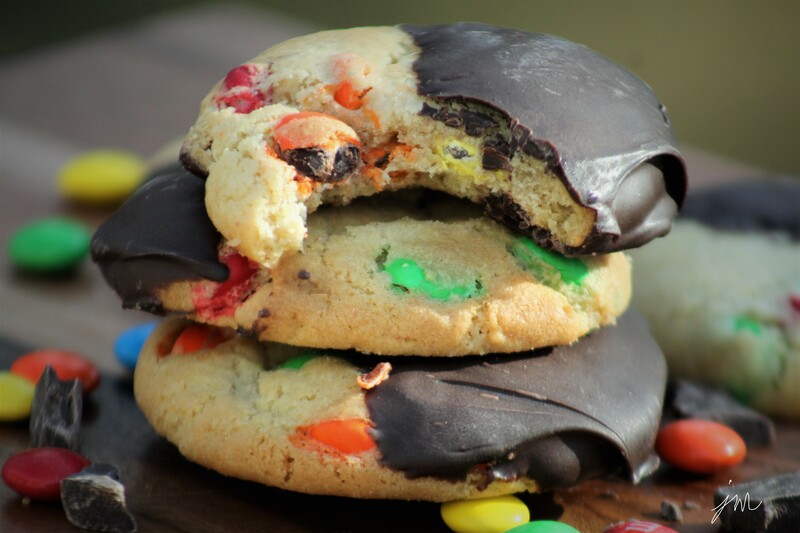 Fold in Caramel M&M Candies. Refrigerate dough for at least 2 hours or up to 2 days. When ready to bake, preheat oven to 375 degrees F. With your hands, form a cookie dough ball about 1-1/2 inches in diameter. Place on baking stone. Bake for 8-10 minutes. Do not overbake. Allow to cool on baking stone for 5-10 minutes, then remove to cooling rack to cool completely. 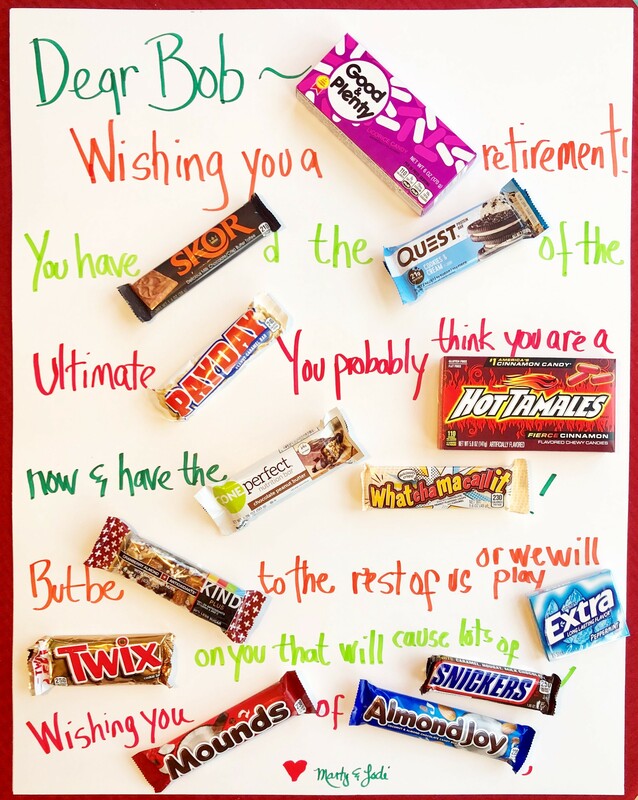 I am not being paid by M&Ms to promote them, though I wish I was! 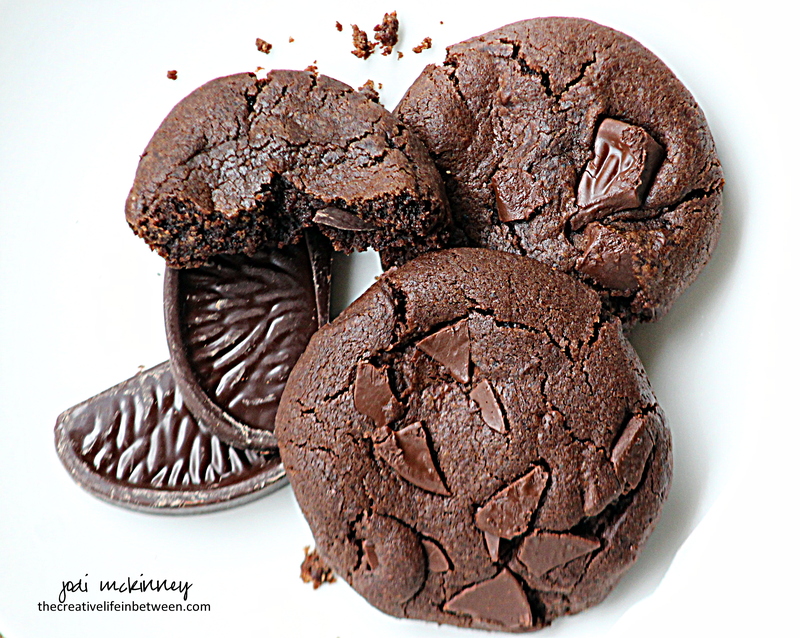 Terry’s Chocolate Orange Double Chocolate Cookies. I’ll bet some of you are surprised to see me baking cookies again after the past month of wedding cookie baking. But those cookies are gone. And we were invited to a friend’s house last weekend for a little get together, and guess what I was asked to bring??? I had a couple of Terry’s Chocolate Oranges in the pantry that I’ve been waiting to make something yummy and chocolatey with, and so I found a recipe that I modified to include them. They were yummy! 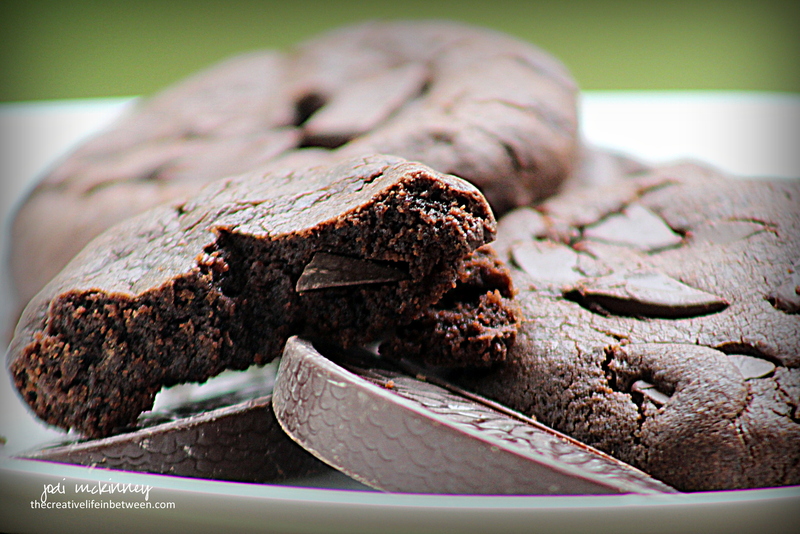 A double chocolate chewy, fudgy cookie with a hint of orange. 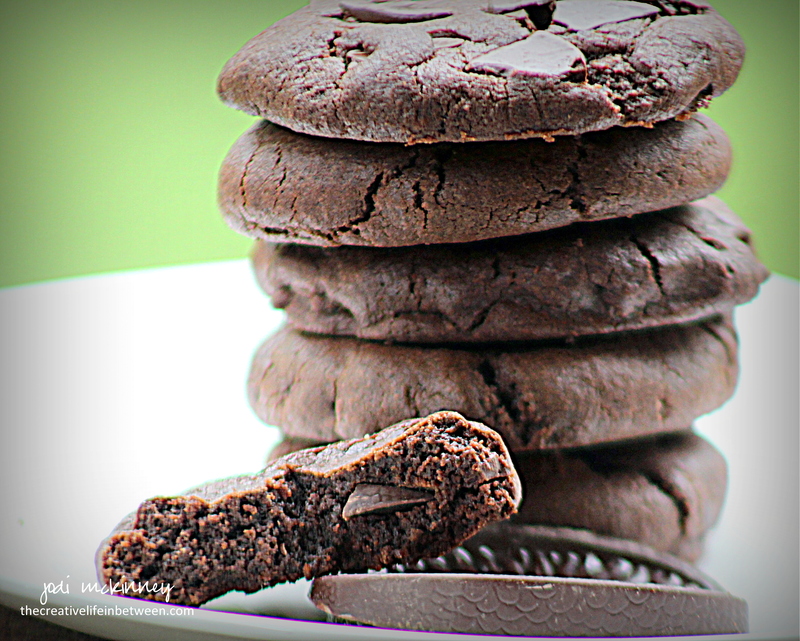 I had to laugh when a friend said he didn’t really like chocolate cookies – while he was eating his fourth one! 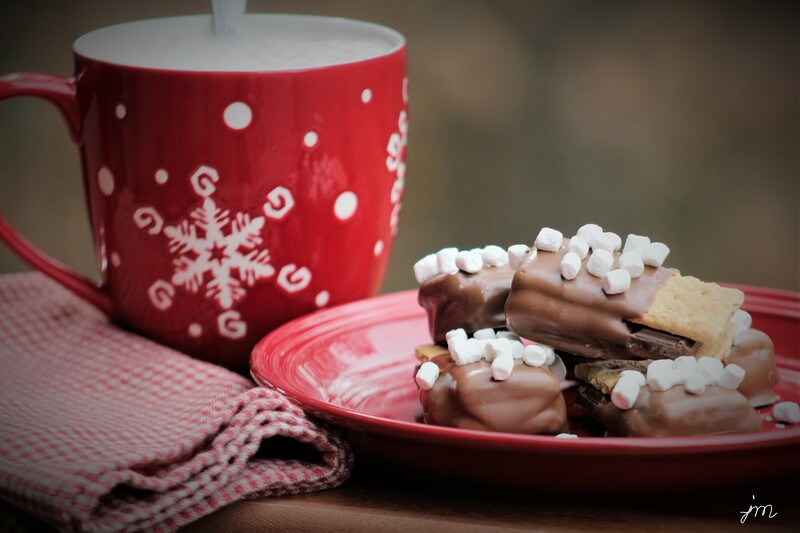 Hope you will give these delightful treats a try! Cream butter and sugar in electric mixer. Beat in eggs and vanilla until light and fluffy. Mix in baking soda and salt. Slowly mix in cocoa powder and flour until combined. Gently stir in chopped Terry’s Chocolate Oranges. Refrigerate for at least two hours or overnight. Preheat oven to 350 degrees F. Drop by tablespoonful onto baking stone or cookie sheet and bake for 8-10 minutes just until set and beginning to crackle. Leave on baking stone for 5 minutes after removing from oven to begin cooling. Transfer to wire rack to cool completely. 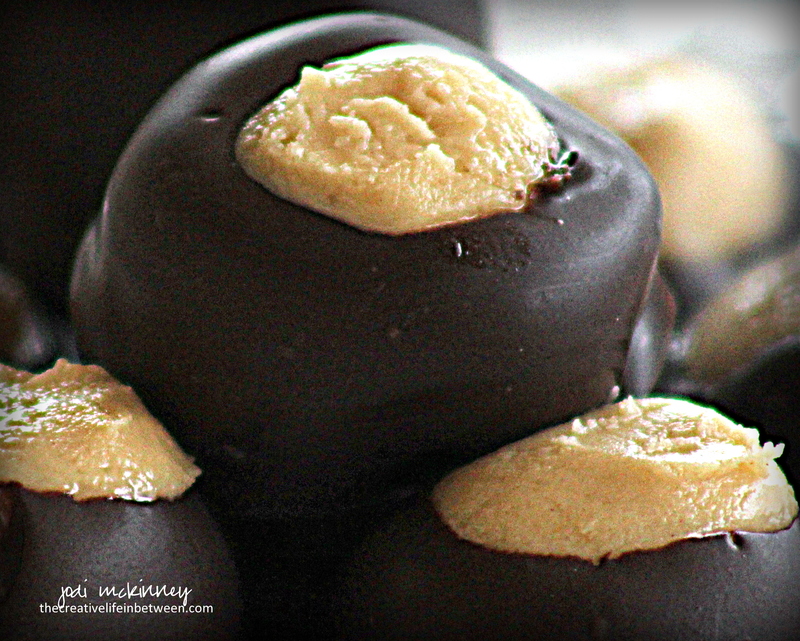 Calling all chocolate and peanut butter lovers! 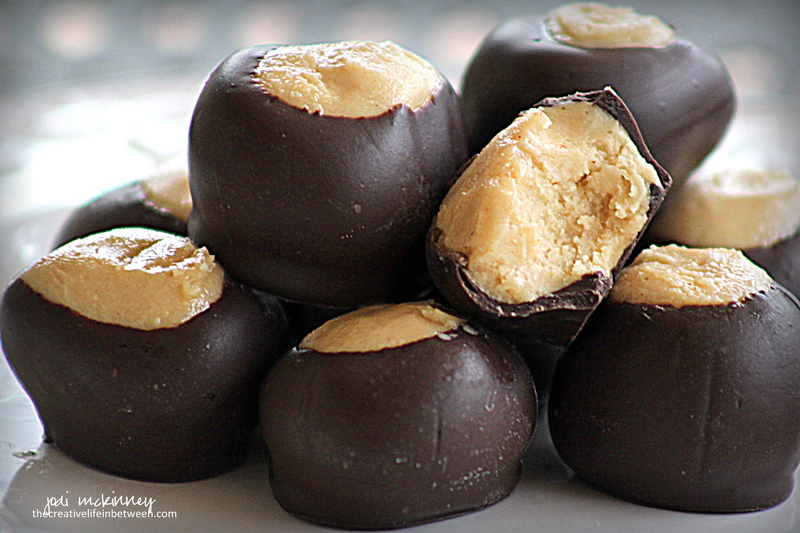 Another must-have “staple” at any Pittsburgh wedding cookie table is the Buckeye Ball! 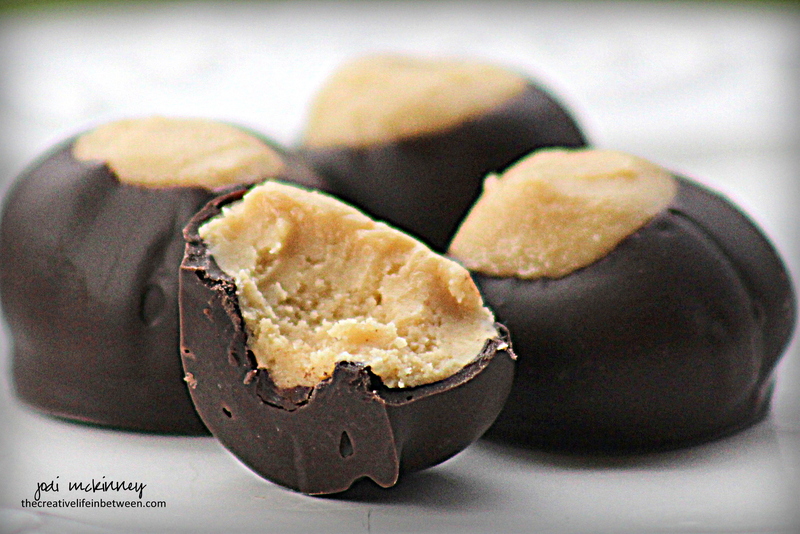 These delectable little creamy peanut butter delights coated in dark chocolate are called Buckeye Balls because they look like Buckeye nuts and originated in Ohio – the Buckeye state. Simple, but absolutely delish, this is cookie #9 on my wedding cookie table list. The freezer is filling up fast, and the wedding date is closing in on us! Cookie baking continues. Here’s the recipe. 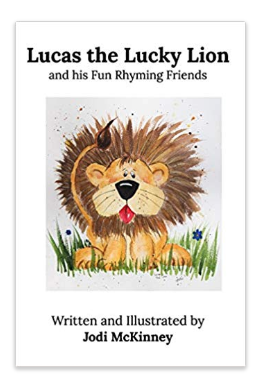 Hope you will give them a try. Mix peanut butter and butter in a bowl with wooden spoon until creamy. Blend in vanilla. Add powdered sugar, and stir until incorporated and a stiff mixture forms. Roll teaspoon-sized pieces into balls, and place on wax paper lined cookie sheet or cutting board. Refrigerate for several hours or overnight. Melt chocolate in narrow deep container in microwave for 1 minute and then at 30 second intervals until smooth. Using a wooden skewer, dip balls into chocolate all but for a bit at top. Place on waxed paper lined cookie sheet. Allow to cool completely and chocolate to harden. Smooth over hole created by skewer with a small spatula or your clean finger. 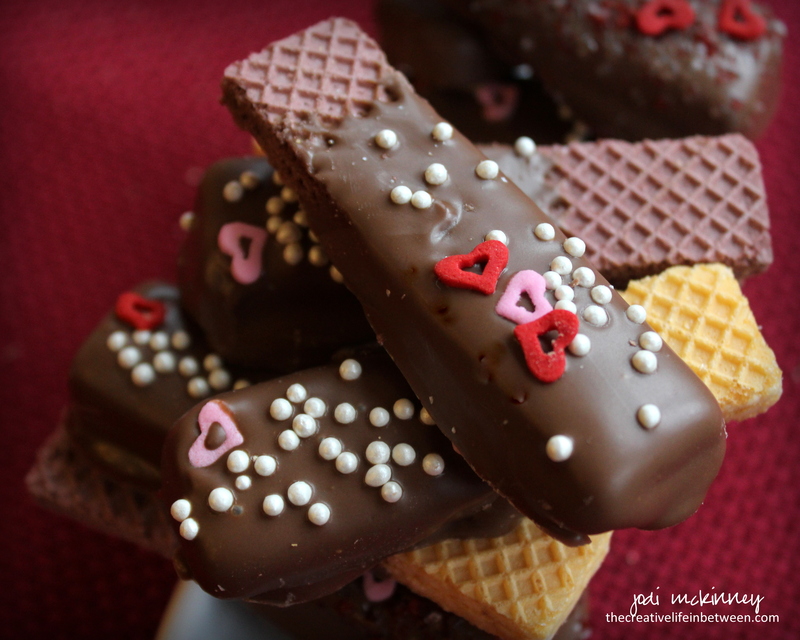 Chocolate Dipped Sugar Wafer Cookies. Remember those light, crispy, sweet wafer cookies you loved as a child that came in fun colors and flavors? Vanilla, Strawberry, Chocolate, even Peanut Butter… Oh how I loved them! Grandma would occasionally get them as a special treat, and we would enjoy them as a late night treat on a hot summer night while sitting outside on the swing catching a cool breeze that could not be felt sitting in the overheated non-air conditioned house. I hadn’t thought about these sugary treats for years, but I recently stopped in a local candy shoppe where they featured a pair of these sweet little cookies dipped in chocolate, sprinkled with colorful sprinkles, and wrapped in cellophane. I couldn’t resist trying – even at the crazy price they were asking… several dollars for two little treats. Well – OMG – there were delish! And I realized they would be so easy to make! So I found them at my local grocery store, where a whole package of sugar wafer cookies cost a whopping 99 cents! 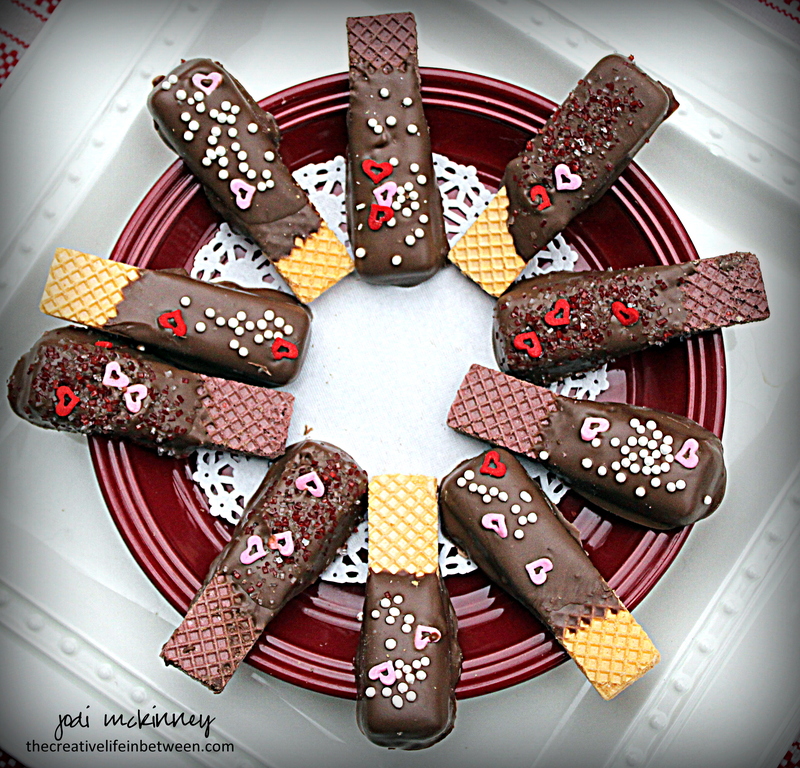 I dipped them in chocolate, sprinkled them with fun Valentine sprinkles, and I’ll be sharing them with some friends I love dearly this weekend! 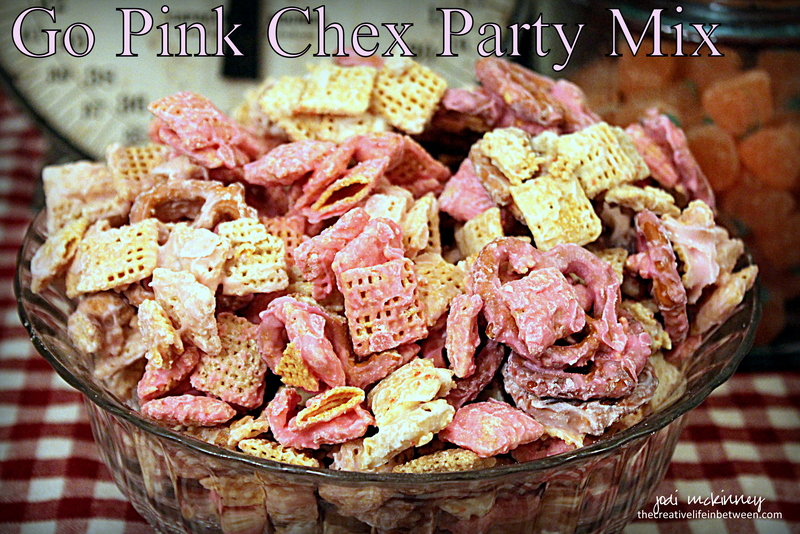 I made this fun pink chex snack mix for our baby shower last week, but it is very also appropriate this month for Pinktober. October is Breast Cancer Awareness Month, and I have a few people very near and dear to me who are survivors – as well as the memory of a very special sister-in-law we lost at the age of 50 to breast cancer. 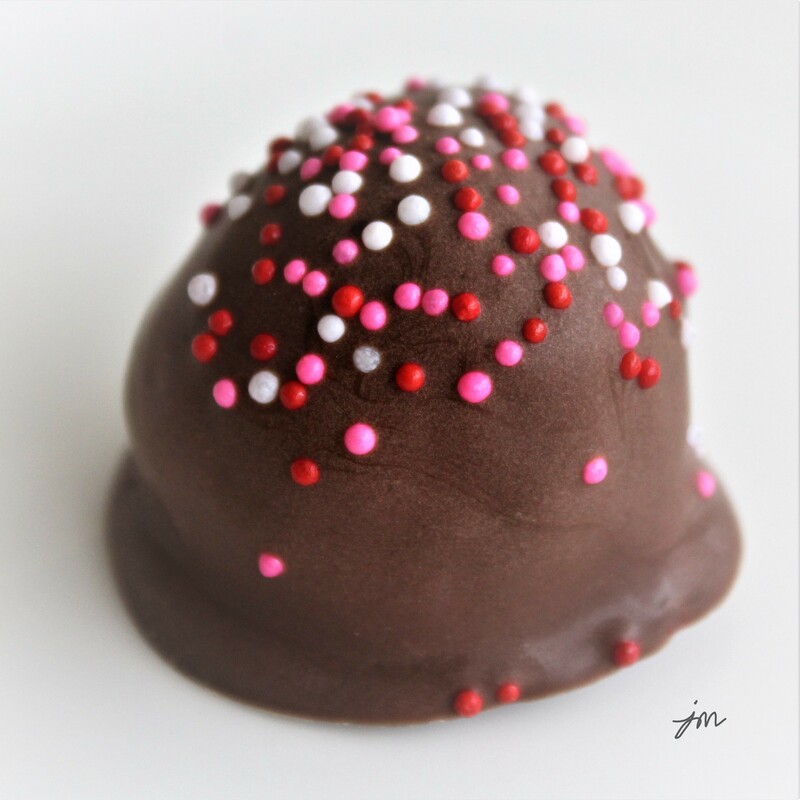 Celebrate… remember… create awareness… enjoy… by sharing this yummy treat with people you love. Mix cereal, peanuts, and pretzels in a large bowl. 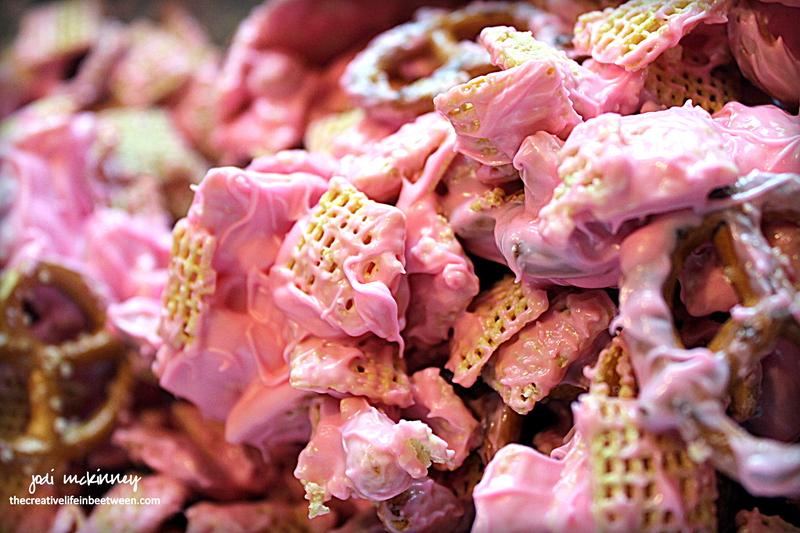 Place candy melts in microwave-safe bowl, and microwave on High for one minute. Stir. Return to microwave for one more minute. Stir. Microwave for additional 30-second intervals if needed until completely melted. (My microwave only took two minutes total to completely melt.) Pour over cereal mix to coat evenly. Spread in single layer onto waxed paper or parchment paper, and let cool completely. Once cool, break into pieces, and store in airtight container. I made a triple batch for our party. I made one with white candy melts, one with light pink, and one with bright pink, then mixed all together. You could also make this with milk chocolate, dark chocolate or any other color candy melts to match your party theme or celebration. It is really yummy…. and really addictive!